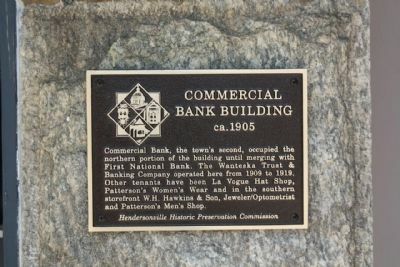 Commercial Bank, the town's second occupied the northern portion of the building until merging with First National Bank. The Wanteska Trust & Banking Company operated here from 1909 to 1919. 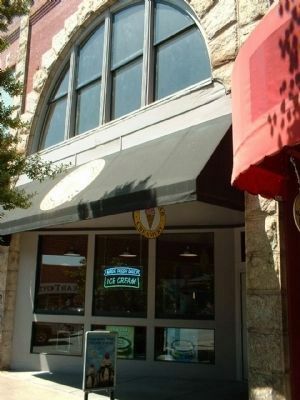 Other tenanta have been La Vouge Hat Shop, Patterson's Women's Wear and in the southern storefront W.H. Hawkins & Son, Jeweler/Optometrist and Patterson's Men's Shop. Location. 35° 19.026′ N, 82° 27.626′ W. Marker is in Hendersonville, North Carolina, in Henderson County. Marker is on North Main Street, on the left when traveling north. Touch for map. Located between 4th and 5th Avenues West. Marker is at or near this postal address: 421 North Main Street, Hendersonville NC 28792, United States of America. Touch for directions. (within shouting distance of this marker); Ewbank & Ewbank Building (within shouting distance of this marker); Citizens National Bank (within shouting distance of this marker); Cole Bank Building (within shouting distance of this marker); Kirk Building (within shouting distance of this marker). Touch for a list and map of all markers in Hendersonville. More. Search the internet for Commercial Bank Building. Credits. This page was last revised on June 16, 2016. This page originally submitted on September 22, 2010, by Mike Stroud of Bluffton, South Carolina. This page has been viewed 499 times since then and 2 times this year. Photos: 1, 2. submitted on September 22, 2010, by Mike Stroud of Bluffton, South Carolina.